Threats to food security have increased around the world following the increasing threat of climate change over the last few years. Such threats have also become apparent in Southeast Asia. This region is home to 10% of the world's population and is host to the world's largest rice and palm oil exporters. Malaysia and Indonesia play an important role in securing the future supplies of palm oil because these two countries account for 85% of global palm oil production. However, the impact of climate change may cause a food crisis in the future, thus raising the possibility of food losses in the region. 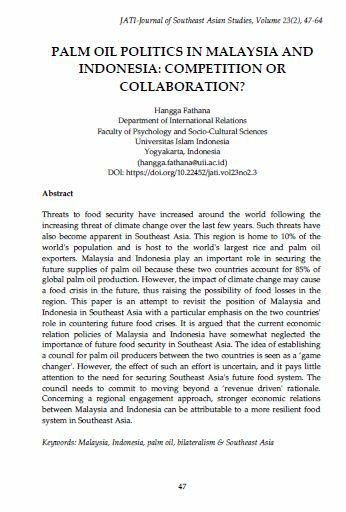 This paper is an attempt to revisit the position of Malaysia and Indonesia in Southeast Asia with a particular emphasis on the two countries' role in countering future food crises. It is argued that the current economic relation policies of Malaysia and Indonesia have somewhat neglected the importance of future food security in Southeast Asia. The idea of establishing a council for palm oil producers between the two countries is seen as a ‘game changer'. However, the effect of such an effort is uncertain, and it pays little attention to the need for securing Southeast Asia's future food system. The council needs to commit to moving beyond a ‘revenue driven' rationale. Concerning a regional engagement approach, stronger economic relations between Malaysia and Indonesia can be attributable to a more resilient food system in Southeast Asia.